I am going to share the recipe for my mom’s famous biscotti. The biscotti that has entranced family, friends, strangers, presidents, and kings. Well, just kidding about the last two. But seriously, these cookies are addictive. And crowd-pleasing. And the perfect accompaniment to tea, coffee, or as your offering to the holiday cookie swap! 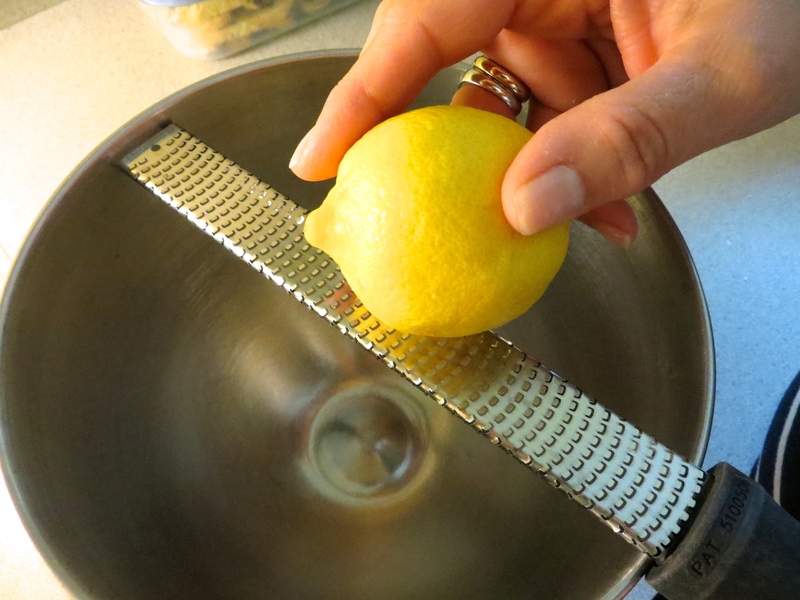 It all starts with zesting a lemon into the bowl of your stand mixer. When the zest is in the bowl, toss in a stick of butter. Then beat the living daylights out of it. And add a couple of eggs. Then carefully add in the dry ingredients. Because my brain is currently being crammed with all sorts of nutrition knowledge, I forgot to snap a photo of the dry ingredients… but they are the basic cookie ingredients – flour, baking powder, and salt. Resist the urge to dive in with a spoon (there’s raw eggs in there, kiddos!). My mom divides up the batter and shapes it into two logs on a parchment-lined cookie sheet. Brush with some beaten egg white and then bake at 350 for about 30-35 minutes. Again, I forgot to take photos but the next steps are simple. You let the logs cool completely before cutting them. Then, using a serrated knife, you cut the logs on a diagonal into ½ inch slices. Biscotti means twice baked in Italian, which is exactly what we are going to do. Lay the biscotti on their sides on a cookie sheet and pop them back into the oven for about 10 minutes. Then pull out the tray, flip the cookies over (please be careful, they are very hot! ), and bake for another 3-5 minutes or until the second side begins to turn golden. All you need to do is plate them up for your next tea party, slip them into cellophane bags for hostess gifts, or place them in a container and keep them all for yourself (I won’t judge, promise!). I hope you enjoy this secret cookie recipe! In a medium-sized bowl, combine flour, baking powder, and salt. Mix well and set aside. In the bowl of a stand mixer, add in the lemon zest, butter, and sugar. Cream together until light and fluffy. Add in the eggs one at a time. Mix well. With the mixer on low, gradually add in the dry ingredients until just combined. Add in the dried cranberries and the walnuts. Mix to combine. Divide the dough in half and form two 2 ½ inch wide x 9 ½ inch long x 1 inch high logs on the parchment paper. Brush the logs with the beaten egg white. Bake for 30-35 minutes. Remove and cool completely. Cut the logs diagonally into ½ inch wide slices and place them cut-side down on a parchment-lined baking sheet. Place into 350° oven for 10 minutes, remove and flip the cookies over, and bake for an additional 3-5 minutes. Cool cookies completely before serving. These look great- just like the ones in shops; so professional!